The audio world has undergone dramatic change since stacks of McIntosh amplifiers powered the iconic Woodstock Festival in 1969. One thing that hasn’t changed much is the signature VU meter that’s become synonymous with McIntosh Labs, which has been making high-performance audio gear since 1949 when Frank McIntosh set out to build a better amplifier. His legacy lives on behind the glowing meters that adorn the elegant glass faceplate of Mac’s latest masterpiece, the MA8000 integrated amplifier.But this is no ordinary integrated amp, with its brushed-aluminum knobs and rack handles, dual-layer stainless-steel chassis, and overall domineering presence. Yes, the MA8000 combines a preamplifier and power amplifier in one component and, in doing so, saves space. But Ron Cornelius, McIntosh training and product manager, is quick to point out that the 100-pound behemoth is “one of the only integrated amplifiers that has the power and functionality of what you usually only find in separate components.” Specifically, a 2 x 300-watt amplifier and a fully featured preamp. 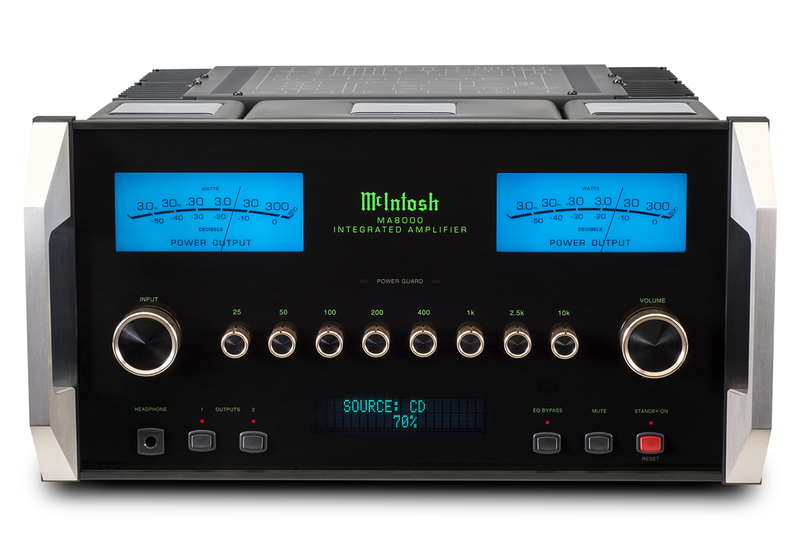 On the power side, you get a solid-state amp that’s “guaranteed” to deliver 300 watts into any speaker load and do so without clipping (McIntosh’s proprietary Autoformer and PowerGuard technologies make this possible). The MA8000 also incorporates Mac’s High Drive headphone amplifier, which Cornelius says is ready to take on virtually any type of headphone—from 20 to 600 ohms. The preamp side also caters to vinyl lovers with separate inputs for moving-magnet and moving-coil phono cartridges, both of which are adjustable via remote control so you can make tweaks while listening from the sweet spot. One more feature worth highlighting: an eight-band EQ that you can set and assign to a specific input.